A lovely fan, truly. Features a three bulb light kit. This Hampton Bay Colonial Bamboo 52 in. 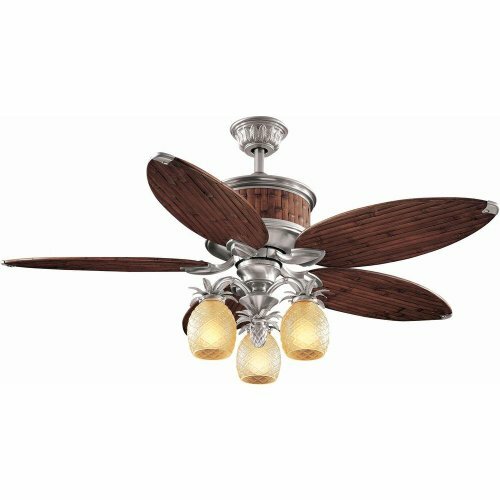 Ceiling Fan features 5 bamboo blades with pewter accents and 3 pineapple-shaped glass light covers offering a decorative tropical flair for indoor spaces. A hand-held remote controls the fan speed and lights for greater convenience, allowing you to adjust the fan from anywhere in the room. The decorative canopy is designed to hide installation screws so as not to detract from the overall decor. This fan can be used in larger spaces up to 20 ft. x 20 ft. in length and width. 5 authentic bamboo blades with decorative vintage pewter accents 3-light kit with pineapple-shaped amber glass. Thermostatic hand-held remote control operates speed and lights. Decorative canopy ring and coupling cover are used to conceal exposed screws. Where can I find a manual for my Hampton Bay ceiling fan? Why does my Hampton Bay fan turn on and off by itself? How can I reach Hampton Bay Customer Service or Support?